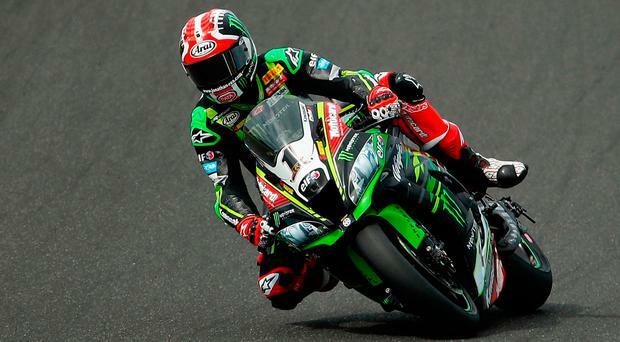 Jonathan Rea - going for a fourth successive World title - and Chas Davies set identical times of 1m 46.686secs in yesterday's third and final practice session at Imola in Italy. Davies (Ducati) was declared first and Rea (Kawasaki) second, however, as the Welshman had set the second fastest time between the pair. Ulsterman Rea had been on course to top the third session and was sitting in his pit when Davies put in the time that equalled Rea's on his 19th and final lap. Fastest in the first two free practice sessions, Rea used the second period to concentrate on race distance set up ahead of today's qualifying and first race during the fifth round of the World Superbike Championship, which he leads by 30 points from Davies. Rea said: "It was a positive day and we just basically continued on from what we worked on in the recent test at Brno. "We worked on the ride height with two different tyres. We will try our best in qualifying for a good grid place and take it from there." British Superbike championship leader Leon Haslam, riding on board the Puccetti Kawasaki, ended the day in eighth position. On his return to action following injury, Eugene Laverty ended the day in 11th on his Milwaukee Aprilia. Laverty had been amongst the fastest riders all day, but in the closing laps of the tense final session it was only tenths of seconds that determined the order, with the Ulsterman just outside the top 10. Laverty said: "It was good to be back and I felt good physically. I was able to go out and go fast first thing. "It is a tough track to return at and it will be hard over a race distance, but we have had a good start." Andrew Irwin (CIA Landlords Insurance Honda) ended the first day of Supersport practice in 26th on his first visit to the Italian circuit, some three and a half seconds slower than provisional pole man Frederico Caricasulo on one of the official Yamahas.